Jan 19, 2017 in "Epcot International Festival of the Arts"
Bringing together the visual, culinary and performing arts, the Epcot Festival of the Arts is Walt Disney Worlds latest festival, and brand new for 2017. Joining the Epcot Flower & Garden and Food & Wine festivals, the Festival of the Arts follows the successful formula of food kiosks, live entertainment and special merchandise. Visitors to the old Festival of the Masters at Downtown Disney may also recognize elements from that event. Taking place Fridays through Mondays, January 13 to February 20 2017, the festival is included with regular theme park admission, although there are of course some premium packages that can be purchased. While not attempting to offer the range of dishes available at the Epcot Food & Wine Festival, the Food Studio kiosks at Festival of the Arts aim to raise the standard. Each dish is meticulously crafted by hand, often with the help of tweezers. The move to higher end dishes comes at a cost, with most dishes costing around $7, going as high as $14 for a charcuterie plate. Eating around the kiosks has moved way beyond low cost sample plates, and should probably be seen as replacement for a table service restaurant, and a good one at that. The food for the most part is excellent. The vast majority of the dishes we tried were surprisingly well prepared and put together, with some great flavors consistent with some of Disney’s signature table service restaurants. You can view all the Food Studio menus here, along with photos of the kiosks. Our favorite dishes include the Braised Short Rib with Parsnip Purée, Broccolini, Baby Tomatoes and Aged Balsamic, found at the Cuisine Classique kiosk near Italy, and the Cobb Salad with Smoked Duck Breast, Avocado Mousse, Nueske’s Applewood Smoked Bacon and Blue Cheese at E = AT^2 near to Mexico. Both were beautifully prepared and presented, with great flavor and some of the larger portion sizes on offer. The Short Rib melted in the mouth. Desserts were disappointing, with nothing really wowing from the flavor perspective, and coming in at a very high price. Where the dishes excel in looks, the presentation needs to be backed up with taste. The Jumbo Chocolate Chip Cookie comes with a paint brush and paints to add some of your own flair to the 6” cookie. The Decadent Delights kiosk has two chocolate desserts, but neither impressed for the $6 asking price. There are some interesting drinks on offer, including the Deconstructed Breakfast, which is a Twinings Spiced Apple Chai Tea Shake with Maple Bourbon Cream, a Waffle Crisp and Candied Bacon. It tastes as good as it sounds, but for $10 you only get a few mouthfuls. Portion size is small for most dishes, nowhere close to an entree size at a restaurant. Assume most dishes will be appetizer sized, with a couple of bites per plate. The choice between eating around the Food Studio kiosks versus eating at a table service restaurant is up for debate. The kiosks offer a wide variety of dishes, at a high price, in a very informal atmosphere. There is no seating, and in most cases, no table or place to eat it. This is a big problem throughout the festivals, but seemed even more prevalent at the Fest of the Arts. Guests find themselves with a hand-full of exquisitely plated food, and no place to set it down to actually eat it. Street food this isn’t, try eating a Cobb Salad with Smoked Duck Breast, Avocado Mousse, Nueske’s Applewood Smoked Bacon and Blue Cheese on the move while pushing a stroller and dodging the crowds. For a restaurant meal replacement, expect to pay somewhere in the region of $60 per person. 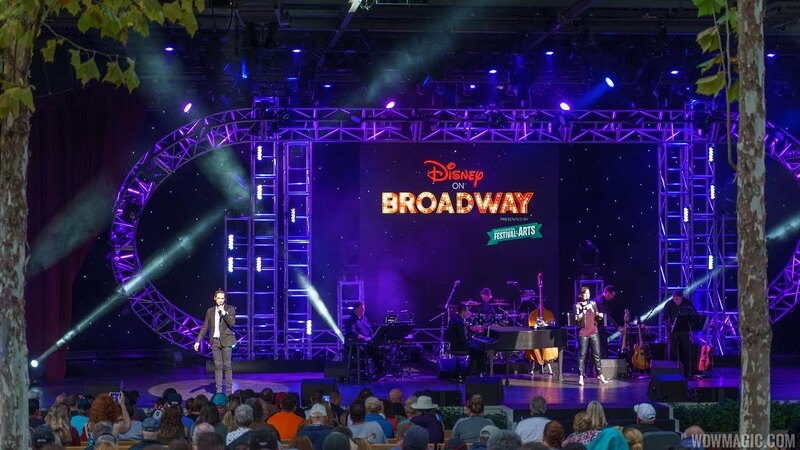 Just like at Food & Wine and Flower & Garden, Festival of the Arts features a live music concert series, bringing a taste of Disney Broadway to World Showcase. During each night of the festival, there are three 30 minute shows, and as with the other festivals, expect them to be very popular. A large portion of the seating is taken by guests who purchased dinner packages that included seating at the concert, and Annual Pass reserved seating areas. The standby line is used to fill in the remainder of the theater, so expect to be at the back amongst those tree trunks and view-blocking support columns. The Dining package includes a three-course meal or full buffet and priority seating at the 8:00pm concert at participating Epcot restaurants. Prices range from $39-$69+ tax for adults, $23-$41+tax for children. The first two weekends feature Ashley Brown and Josh Strickland performing songs from Disney’s Beauty and the Beast, Tarzan, Mary Poppins, The Little Mermaid and Frozen. Schedule of performers for Disney on Broadway, and how to reserve seats for passholders and DVC members. The show is well put together with a live band, and the performers do a great job of showcasing their vocal talents. The food and Broadway show may be the stars of the festival, but the visual arts are represented by visiting artists, demonstrations and galleries throughout the park. The Odyssey Festival Center has two great exhibits displaying the art of Herb Ryman and Mary Blair. Both are worth checking out, with the Herb Ryman focussing on Epcot concept art not to be missed. Guests can take part in a huge mural painting project near to the Canada Pavilion, and traveling Chalk Artists demonstrate their skills. Living Statues take their place at the Fountain Stage, giving guests a great photo opportunity with a Spaceship Earth backdrop. The Fountain Stage is also home to performances from various musical groups, including local school and college bands, and Epcot’s own American Music Machine. Workshops include gesture drawing class, watercolor painting, mixed media art, calligraphy and floral arrangements. The Interactive Workshops are $39+tax each Friday-Monday of the Festival, although there is a 15% discount for passholders and DVC members. See the full listing. Not everything in the Odyssey Festival Center carries an admission fee, with complimentary seminars also on offer. Talks include Cel painting, Watermelon Carving and Photography 101. Another welcome activity is a return of Animation Academy from Disney's Hollywood Studios. The old Vision House inside Innoventions is home to the class that teaches you how to draw a Disney character. As Epcot moves to almost year-round festivals, the Epcot International Festival of the Arts clearly has a lot of potential. For its inaugural year, the event has a good amount of substance, and if you are in the area, it is well worth a trip to Epcot. It probably isn’t at the point of planning an entire vacation around, as many do for the Food and Wine Festival, but that may well change as the festival grows in the coming years. If you are planning a trip to Epcot and are not interested in the Festival of the Arts, be aware that it does appear to be bringing in a lot of locals, and the park was very busy throughout the opening weekend. For more on the 2017 Epcot Festival of the Arts, be sure to check out our photo galleries and listing of events and schedules.